We are one of the foremost coarse Semolina Flour manufacturers, located in India. For keeping the natural taste as well as nutritional vales, we strictly accentuate on the modern packaging methods as per international quality standards. Since we maintain the superior quality of our products, our semolina flour is high in demand throughout the globe. We have voluminous experience in the manufacturing of semolina flour. We offer fine semolina flour at the most reasonable price. 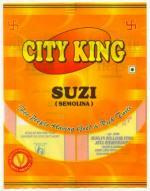 It can be used in variety of items such as Idly, Rawa Dosa, Machroni Rusks etc.